Truly well-written and thought-provoking plays are hard to come by, but Theater 167's presentation of J. Stephen Brantley's Pirira, which I caught at its recent extended run at the West End Theater, comes pretty close to being as transcendental as any that I have seen in the past few years. The topics of the play are nominally AIDS, poverty, homophobia, misogyny, white and black guilt--but really Pirira treats the human condition in a way that only the best theater does. 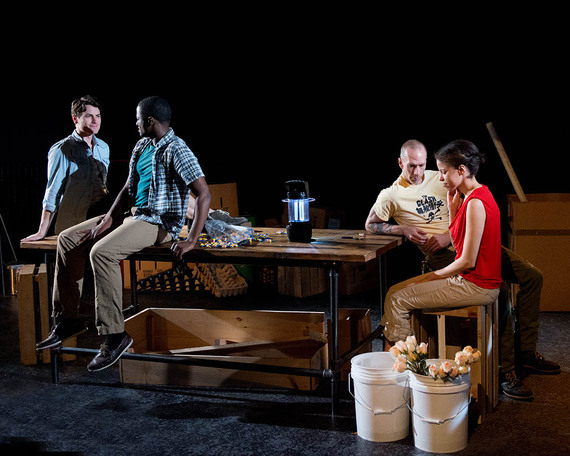 The play takes place in two unlikely settings: the storage room of a small NGO in Lilongwe, Malawi and the stock room of a wholesale florist in New York City's Flower District. The very pretty and headstrong Ericka (Flor De Liz Perez) is in Malawi as a volunteer, taking a break from a Wall Street career when she meets Jack (Stephen Brantley), a Californian who works for the NGO digging water wells for the local population. Ericka gets caught in the crossfires of an angry demonstration, and Jack saves her by carrying her down into a basement--where the demonstrators promptly lock them in! Jack really believes in what he is doing, while Ericka, who grew up in the projects of Brooklyn, sees him as just another white guy trying to "save Africa." He also has a few false preconceived notions about Ericka, it turns out. Back in Chelsea, Chad (played by the fine featured Todd Flaherty) is an apparently disaffected young gay man who gets stuck one early morning talking to Gilbert (Adrian Baidoo) during a power outage in the flower shop basement. Gilbert is in the States studying on a scholarship and hopes to return to his native Malawi to open a night club. Chad spends a good part of the play trying to deconstruct Gilbert's homophobia and outdated views on gender roles. Gilbert it turns out comes from a family that has been affected by AIDS, and Chad has also undergone a life-altering event that he still has not overcome. If this all sounds a bit heavy, Pirira is not. There are of course shades of Sartre's No Exit at first, but the play manages to roll along at a bubbly, almost effervescent pace in spite of the very serious subject matter at hand--credit in this case must go to the playwright and his nimble, clever dialogue. At one point Flaherty tries to rap, rhyming "Gilbert" with "filbert"--it may be one of the worst raps in recent musical history. In another affecting moment, Jack surprises Ericka by playing a truly melodic guitar rendition. In a sense, Brantley has done away with traditional Aristotelian notions of time and space--everything takes place with all four actors on stage together throughout the play's seventy minute run. The dialogue weaves in and out between the two duos but it is more subtle and complex than that, as one line from one duo's dialogue is picked up by an actor in the second duo. This is no easy task, even for the talented quartet in question. The dialogue must more or less be delivered flawlessly for the quick-paced dialogue to move forward--less gifted actors might easily trip over each other's lines. In a few instances, more projection on the part of the cast might make the dialogue even clearer, but this is a minor criticism. As the play rolls to its emotional finale, Ericka and Jack on the one hand and Chad and Gilbert on the other find that they are both attracted and repelled by each other, but they also learn that their notions of one other are skewed in ways revealing and (un)expected. The play is more than ably directed by Ari Laura Kreith who brings out the best in this difficult and novel staging. The audience at once takes in the commonalities between the two boys locked in the storage room and their counterparts in Malawi, while also keeping them distinct. It's no small feat. As we find out the details behind the personal tragedies that have in fact propelled each of the four characters to where they find themselves today, we can only smile at the way playwright and actors arrive at satisfying resolutions in this truly lovely production.